We’re back for another spin on the Ivory Joe Hunter musical merry-go-round. 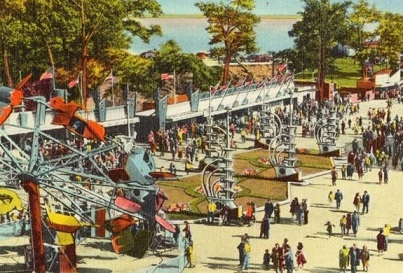 A pleasant way to spend the afternoon if you find yourself in the rock ‘n’ roll theme park now that the weather is warming up for June of ’48 but certainly not a ride you’re going to be telling all your friends about when you get back home. There’s no thrilling roller coasters or heart-stopping tower drops in Ivory Joe Hunter Land. Just a sedate spin around a brightly colored carousel, the scent of popcorn and cotton candy wafting through the air while the warm sun and slow pace may have you nodding off by the end of the day. Okay, so that’s a bit harsh and I really don’t mean to be. I’ll admit that kind of tranquil setting with the right peripheral atmospheric touches can be very enjoyable in its own right. If the park is clean and not too crowded with no long lines to wait in, the employees are always smiling, the food is good and the prices reasonable, sure, go spend a Sunday there and have fun. After all it’s better than spending the day indoors dozing on the couch or cleaning out the garage. But it’s just that in the rock ‘n’ roll neighborhood it’s not the lazy Sunday afternoons that we look forward to. We tend to prefer the types of scenes that are jumping on a Saturday night. You know those places – loud, crowded, with lots of fast action, the kind of joint where you might get your pocket picked or wind up in a fight if somebody takes offense to your stepping on their foot while trying to get to the bar. A sleazy dive with lots of girls with little clothing and less in the way of inhibitions where you can rest assured that if you stay for long you’ll wind up broke and hung-over with a pounding headache the next morning. But the rides you’ll go on while you’re there will always be exhilarating and leave you craving more. Hunter wasn’t the kind of cat who frequented places like that much. He’d be nice about it if you called him and asked him if he wanted to go, but would politely decline most of the time all the same. In fact the last record put out by Hunter, Don’t Fall In Love With Me, was doing quite well, cracking the Race Charts just as this follow-up was being released. So why wasn’t THAT song being reviewed? Well, as stated before Spontaneous Lunacy is the history of rock ‘n’ roll and thus by definition all of the reviews are of rock ‘n’ roll songs aimed at rock audiences. Now occasionally, usually once an artist has become well established as a rocker but then releases something a bit more pop we’ll include it for continuity sake (for the record the flip side, Siesta With Sonny, did get a review here), but since Hunter’s records to date have been on the outskirts of the genre we’re covering his ultimate direction is still largely up in the air. When that tame and proper single started making waves there was a very good chance that he might head in that direction entirely if he felt that’s where the audience was and thus we’d never see or hear from him again. It didn’t quite happen, largely because Hunter never seemed to follow the crowds. He simply wrote and performed whatever tickled his fancy at the time and remained somewhat hard to pin down as a result of it. But that was both Hunter’s curse and his blessing. He was so prolific, so versatile, such a tireless craftsman, that he could churn out songs in every conceivable style, each one theoretically appealing to a different constituency entirely. If you liked one record of his you weren’t guaranteed of liking the next three, simply because they were made for someone with completely different tastes than you. Yet he wasn’t a musical schizophrenic either – all were instantly recognizable as Ivory Joe Hunter records by his mellow baritone and silky piano – but because they weren’t cut from the same cloth you basically had to take your chances with him and hope for the best when taking his records up to the counter to buy. You’d never be completely disappointed, he was far too skilled not to have at least some aspect of each record that was appealing, but thus far anyway, you’d rarely be knocked out by whatever he did. A thrill ride at the carnival he was not. So it comes as no surprise that What Did You Do To Me is no exception to that rule. To be perfectly honest I could’ve left this one out of the reviews too, and almost did, but June of ’48 was a slow month for rock releases and Hunter, even when he veers towards the bland is still worth checking out. Unlike Don’t Fall In Love With Me, which was pure pop right down to the supper club tone of horns, at least What Did You Do To Me improved on that aspect and moves back towards the rock field. Of course they were cut the same day with the same musicians, which only proves that with Hunter intent is everything. Here his intent isn’t quite jumping hip-deep into a rock vibe, more like wading ankle deep on the shore. Hunter’s emphasizing the rhythm a little more… very little, but at least it’s not devoid of rhythm. His vocals too have shed most of their starched shirt mannerisms that plagued “Don’t Fall In Love With Me” and he seems almost to be channeling Amos Milburn a little at times here, which is always a good thing. It helps of course that the story line is much more appropriate for the rock field too. Despondency over the departure of a girl is always ripe for the picking and Hunter tackles it with his usual keen eye, injecting even the simplest of lines with a measure of soulfulness and genuine hurt. The pace is slow as a result of the mood he’s projecting but he manages to spice things up with some quirky fills on the keys, sometimes almost stuttering with his passages, like they’re about to fall out of step with the rest of the band, yet he pulls it back into the fold with room to spare. The fact he’s relying more on his left hand than the dainty treble keys under his right hand helps give this a little more heft to it as well and thankfully the saxophone, while not exactly getting down and dirty at least has a modicum of grit in the more full beefy lines. For once there’s no glaringly dated weak spots, even if there aren’t too many things that really stand out either. Like the merry-go-round is in the fairgrounds What Did You Do To Me is a safe and predictable ride. Though I’ve made mention of Hunter’s writing skills, particularly his lyrics, in past reviews, you probably have noticed that I’ve not yet been able to produce actual evidence as to particularly notable wordplay. That unfortunate trend continues here. The lyrics are reasonably effective but decidedly simple and straightforward, offering up the plot outline in the most basic of terms while giving no juicy details or quirky lines that will draw notice. In fact his best moments in that regard come at the very end when he shifts tone to a more conversational, faux ad-libbed coda, as if he’s speaking to her directly rather than addressing the listening audience. It’s a moment that draws you in and makes you want to hear more of this, the off-the-record asides as it were, something that may let on how he’s really feeling beneath his placid exterior. Brief though it may be it at least gives you SOME insight into why his reputation was as high as it was among his peers and would remain so even to this day among aficionados of the 40’s and 50’s rock scenes. The problem with his mostly underwhelming performances thus far, I suspect, is simply that he was so overflowing with ideas that he didn’t quite work them all out enough in advance. This, from his final session of the year, was one of 41 sides he cut in 1947 alone and so I’m sure he was trying to get by with rougher sketches, especially since with that much material he knew a lot of it was at risk for being left on the shelf. Also his personality seemed to be such that he was amenable to whatever direction the labels wanted to market him in so he probably felt compelled to offer up as many different types of songs as he could, seeing what they jumped on and then hoping to polish it up a bit before cutting it for release. But with the recording ban looming there simply wasn’t time with this particular December session anyway. The studio was booked solid for the last month of the year in an effort to stockpile as many tunes from as many artists as possible and so Hunter dutifully churned out what he had, as is, and took his chances. I don’t think it’s a coincidence that when he returned to the studio again a year later, once the ban ended, the quality of his output was much higher as he’d had the required time to consolidate his best ideas and craft the songs better well before he went in to lay them down. It’s not surprising that his most successful commercial run followed in short order. But all of that is speculation and educated guesses. To the record buyer in the summer of 1948 the circumstances surrounding his sessions wouldn’t have mattered, only the appeal – or lack thereof – for the resulting record. What Did You Do To Me didn’t set the world on fire, it was too laid back and non-distinctive for that, but it sold steadily so the public seems to have liked it much better than I do. As with the even more milquetoast “Don’t Fall In Love With Me” this too cracked the Top Ten of the Billboard charts, though maybe the success of both was due more to them riding the coattails of Pretty Mama Blues which would sit a top those charts. Regardless of the reasons their solid sales at least validated King Records decision to sign him, even if his biggest success was still coming on a competing label. That would change in due time, as would his rather nondescript output, but for the moment this was more of the same from reliably steady Ivory Joe. A safe and easy ride on a musical carousel in the shadow of the more dangerous and exciting roller coasters from which the sounds of the ensuing screams and excitement were getting ever closer to drowning him out in the rock world he found himself in. 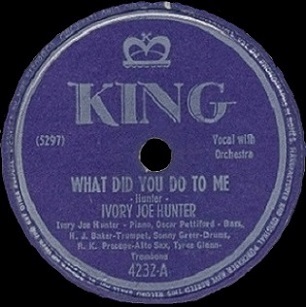 Leave a reply on "Ivory Joe Hunter: “What Did You Do To Me”"